With a generously sized 376 Litre effective capacity and robust, commercial design, the Polar Single Door Freezer is the ideal addition to kitchens in many sectors including education, healthcare, restaurants and takeaways. With powerful fan assisted cooling, temperatures are regulated precisely and the large 2/1 GN compatible interior is incredibly versatile. 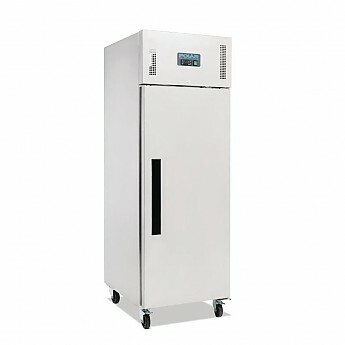 The freezer is also simple to clean and position, thanks to removable door seals and heavy duty castors. It also features a sturdy lockable self-closing stainless steel door and high quality 60mm insulation, which helps to reduce running costs and secure your produce overnight. Finish - internal Aluminium Gastronorm 2/1 interior.